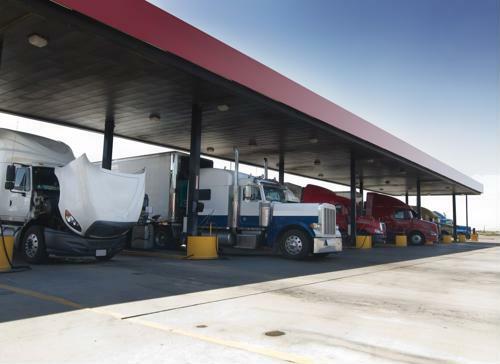 The amount of money truckers spend on fuel alone every year stretches easily into the tens of thousands of dollars, and every little bit helps when it comes to cutting those expenses. Fortunately, there are many ways to increase fuel efficiency or otherwise reduce consumption. One of the biggest factors in how much fuel you burn is how fast you go, according to Trucking Info. While estimates vary, the general rule is that for every extra mile per hour above the speed limit you drive, you lose an extra 0.14 miles per gallon. That may not sound like much, but over the course of a week, the added cost of going just 10 miles an hour faster comes to more than $500. When your tires are running a little low on air, they create more drag and slow your big rig down, meaning it will require more gas to reach and maintain the same speeds, Trucking Info added. As such, you should strive to keep your tires properly inflated at all times, because it's not only a fuel efficiency issue, it may also be a safety concern. The bigger the load you're hauling, the more fuel you're going to consume getting from Point A to Point B, according to American Trucker. Consequently, if you keep your loads reasonably sized and don't go above your truck's proscribed limits, your vehicle will run better and get more mileage out of every gallon of fuel. Just like everything else, if you don't take proper care of your truck, its performance will deteriorate over time. As a result, you should get it serviced as often as possible so that you don't encounter any issues with how - or whether - it works. Those maintenance efforts should also include making sure your oil is being changed regularly. When you slam on the brakes, your vehicle slows down rather quickly and jarringly, and it will require more gas to get back to your comfortable running speed, according to Arrow. Likewise, when you really step on the gas, your fuel efficiency goes way down because the engine is trying to get up to speed too quickly. With that in mind, avoiding heavy braking or accelerating will help your truck run smoothly and more efficiently. All too often, truckers idle their rigs for convenience and comfort, but doing so is going to burn a lot of fuel. While idling is sometimes unavoidable, shutting the engine off whenever it makes sense won't improve your fuel efficiency, per se, but it will certainly reduce the amount you're using in a given week. The ability to cut fuel expenses by potentially thousands of dollars over the course of the year is something no trucker should pass up. The more they can do to follow these tips, the better off they will be.